21-Day Tummy is a diet plan that targets excess weight and belly fat while also dealing with common digestive problems. You will shrink your waistline, soothe your stomach and reduce your dependence on antacids and other medications. Her sensitive stomach meal plan helps dieters address the root of the problem by reducing inflammation and balancing gut flora. 21-Day Tummy is designed specifically for people with digestive issues. You can lose up to 4 ½ inches off your belly as you learn about foods that protect your digestion. Vaccariello details how chronic inflammation and the wrong diet can weaken immunity, imbalance gut flora, and damage digestive function. Even some seemingly “healthy” foods can cause gas and bloating, heartburn, indigestion, constipation, and IBS flare-ups. This program helps you break the vicious cycle and alleviate your symptoms by eating foods that are right for your body. You will learn how to identify potential problematic foods that may be aggravating your digestive issues. However, guidelines are offered on how you can eventually incorporate trigger foods back into your diet. This means you don’t have to give up your favorite foods forever. Each meal helps improve digestive function while simultaneously helping you achieve a flat belly. Eggs, salmon, pork tenderloin, cheese, nonfat Greek yogurt, oat bran, almonds, pine nuts, natural peanut butter, chia seeds, romaine lettuce, endive, potatoes, tomatoes, carrot, red pepper, papaya, banana, strawberries, oranges, lemon, extra-virgin olive oil, pure maple syrup. The book includes an optional workout plan that combines walking, yoga and core strengthening exercises to both sculpt and soothe your belly. Readers are especially recommended to do yoga and breathing exercises. These activities help reduce stress, which is often a major cause of digestive problems. 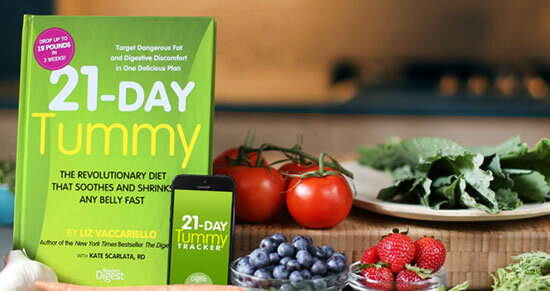 21-Day Tummy: The Revolutionary Food Plan that Shrinks and Soothes Any Belly Fast retails at $26.99. Can eliminate the need for heartburn medication. Helps you identify potential trigger foods without the need to follow complicated elimination diets. Provides a meal plan and recipes. Tummy Tracker App is available to track your symptoms, create meal plans, view recipes and monitor your progress. Includes inspirational stories from people who have had success with the program. The complete plan comes with a 14-day money back guarantee. Requires avoiding a variety of different foods including coffee and wine. Some individuals may need to consult with a health professional to effectively manage their condition. Targeted fat reduction is a myth. 21-Day Tummy is a low-carb, anti-inflammatory diet for people with sensitive stomachs. This plan can help you lose belly fat while also alleviating the primary causes of common digestive problems. See also: The Official 21 Day Tummy Website Here.